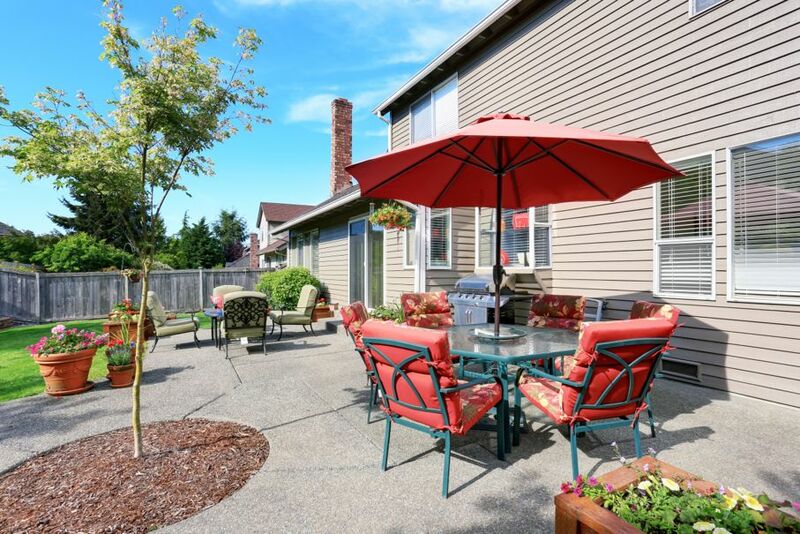 Just because you’re on a tight budget doesn’t mean you can’t create a backyard patio oasis. Budget-friendly patio designs are out there. You just gotta get creative! Outdoor living areas are a vital space for many families, including my own. And now that the air is finally starting to cool and the swarms of mosquitoes are beginning to die down, it’s the perfect time of the year to sit outside and relax. But a simple camping chair just won’t do. You deserve more than that! Unfortunately, outdoor furniture can get ridiculously expensive if you have fancy tastes or you’re looking for quality materials. Then, once you add in all those special touches such as lighting and décor, the costs start adding up quickly. Don’t despair, just get creative. Check out these four ways to create a budget-friendly outdoor patio you’ll want to lounge in all year-long. First things first, before you spend an arm and a leg on new design elements, take a look at what you have. Recycling and repurposing are always the way to go when you’re trying to save money. 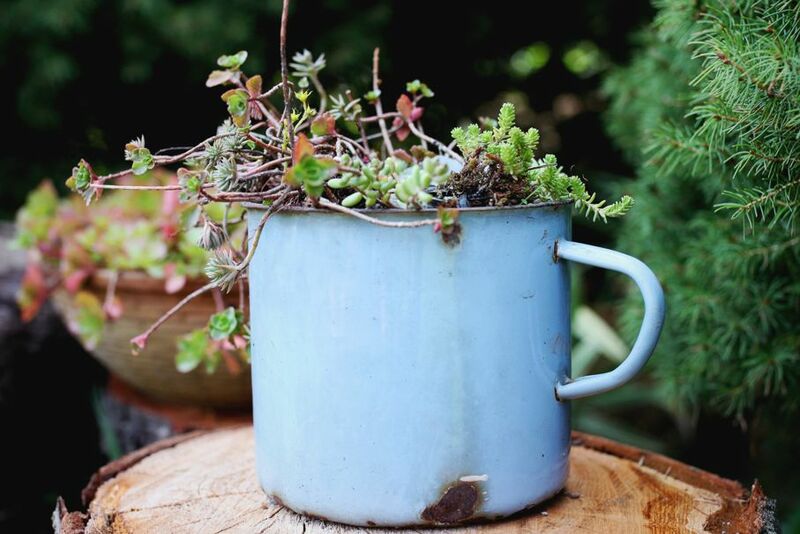 For example, use old ceramic planters as side tables and use potted plants as centerpieces. If you happen to come across an old table or pillows, such the set you see below (it was just sitting in my basement collecting dust), give them a quick scrub and set them out. Yard sales and thrift stores are also great places to find cheap, useable outdoor patio furniture and accessories. If you’re eager to get a new furniture set, don’t get too concerned about the materials it’s made from. Even though affordable patio furniture isn’t always made of good (or even decent) quality materials, you can still make it work and last a while if you take care of it from the get-go. We purchased a very affordable outdoor sofa set with a stainless-steel frame and webbing made of PE Rattan. PE Rattan isn’t made of the same natural fibers that make up rattan and wicker. Instead, it’s comprised of plastic designed to mimic rattan. For added protection, purchase a tarp to cover your furniture to ensure it doesn’t rust or fade while it’s not in use. Since this set was so affordable, I don’t think I’ll mind too much when/if I need to replace it in 3-5 years! If you’re not interested in plastic, consider another budget-friendly outdoor furniture material such as aluminum. For furniture cushions, the fabric really does matter. But if your cushions don’t look like they’ll hold up to the elements well, purchase a fabric protector like Scotchgard and apply it liberally. You may have to do this two to three times every year to maintain weather-resistance, but it’s guaranteed to keep them in-use longer. It’s also a good practice to bring your cushions inside during inclement weather or, at the very least, put them in a waterproof outdoor storage container. Outdoor lighting options range the gamut from fancy to flimsy. Believe me, I love a good set of string lights like the next person, but ones made of commercial-grade cord and mood-setting incandescent bulbs are way too expensive when you’re worried about the bottom-line. 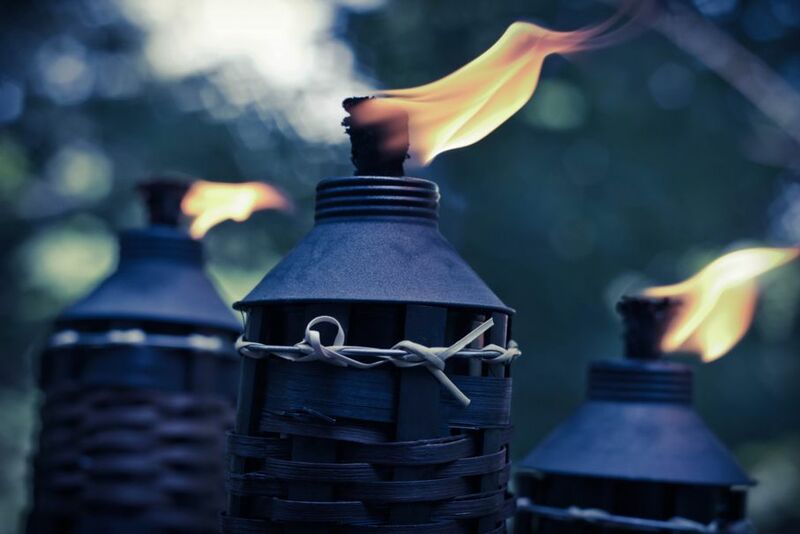 Make it easy on yourself and use tiki torches and candles. Outline your seating area with these fun, versatile torches and just be sure to have enough lighter fluid on-hand to keep them lit. You can also place candles and other decorative lanterns around your seating area. They’ll keep the bugs away and add a nice, calming ambiance. Complete your outdoor patio space by focusing on the details. You already have some lighting up and your furniture set. Now it’s time to think on a smaller scale. Consider affordable throw pillows and seasonal, potted plants to help add a bit of life and energy to your outdoor area. Bird feeders and iron/metal decorations are also great for outdoor areas. If shade from the sun is a necessity, don’t give in to the urge to get a retractable awning. Instead, try a small patio umbrella or invest in an affordable, breathable sun shade made from polyethylene. It’ll get the job done, and you’ll save hundreds, if not thousands. Since outdoor rugs are sometimes pricey, use doormats in key areas such as at the foot of a chair or underneath an end table. No matter what, a touch of color is bound to make the space more inviting. 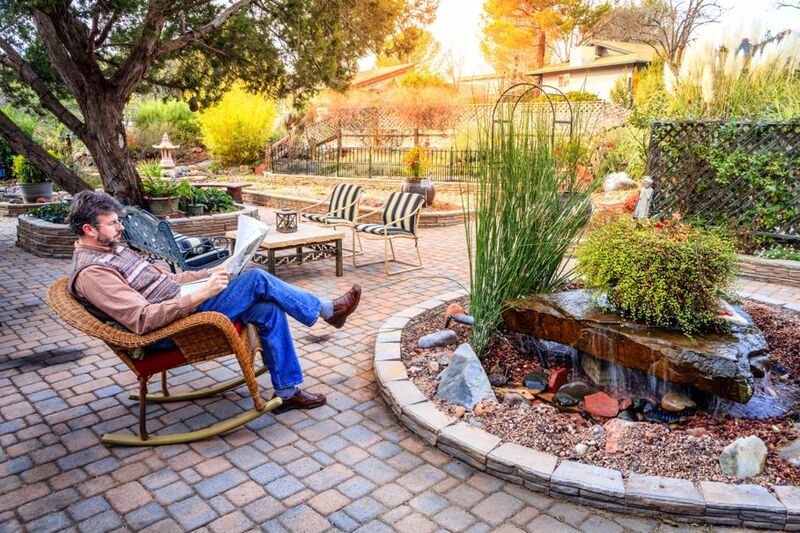 What types of budget-friendly patio designs have you incorporated in your outdoor living space? Share your tips and tricks below!